In the recurring billing model, attention is directed on what a business has to offer, be it goods or services, and how to deliver that product. While those things are of course important, too often, the customer get less attention once the sale is complete. Just what do you need to do to shift that focus back to the customer? This was something that I found myself mulling over in the most unlikely of places. A few days ago, my husband and I attended a concert at a new (to us) venue. Before going, I poured over the venue’s website to make sure I was aware of all the ins and outs of what to expect. Armed with ‘book knowledge’ of the situation was a good guide, but actually being there was when the true learning began. What caught me off guard, admittedly, was that the staff at the venue went out of their way to make the experience the best possible for concert-goers. I learned that there was a lot that I had no way of knowing beforehand until we were actually there, but help was there in the most subtle of ways, truly guiding us through the process. From the simple adjustment allowing earlier parking to accommodate traffic for the sold-out concert, through to the triumphant final notes of Steely Dan’s encore, I realized that the entire experience was based around us, as customers. Throughout the 8-hour time, the nod to us, was just as amazing as the performance itself. That consumer-driven approach isn’t just for music fans, though. Taking a lesson from my concert experience, here are some things to keep in mind as a subscription-based business. 1. Have concise rules on your recurring billing methodologies. Communicate with the customer to let them know what will happen if their credit card billing fails. Is your system set up to immediately cancel their subscription if the payment lapses? Are they going to be surprised with immediate cancellation? Or do you have procedures in place to automatically retry billing their credit card on file? Make sure your customer is aware of your billing policies will help mitigate churn. These rules are in place to allow everything to run seamlessly, and to protect both the business and the client. Think of them as the metal detectors we encountered when entering the venue. Did it slow things down a bit? Actually, not as much as you would think, because the organizers had the tools in place (in the form of extra screeners and devices portable screening devices) to move the crowds through swiftly. Preplanning eliminated the bottlenecks just as efficiently as the robust dunning management system that you find with leading recurring billing software. With dunning management, businesses can streamline retrying cards that were initially declined in the payment process. This system can also control the number of retries, convey success through reporting tools, and effectively communicate with customers about the overall retry process. Checks and balances aren’t just important for customers. On the business side, these systems are critical to keep the workflow running smoothly. When working with a customer, if a certain problem arises, how are you going to handle it? Do you have a solid return policy in place, or does that department wing it, depending on the situation? When systems are not concisely laid out, confusion reigns, the customer suffers and then she may have enough reason to take her business elsewhere. 2. Offer customer support every step of the way. 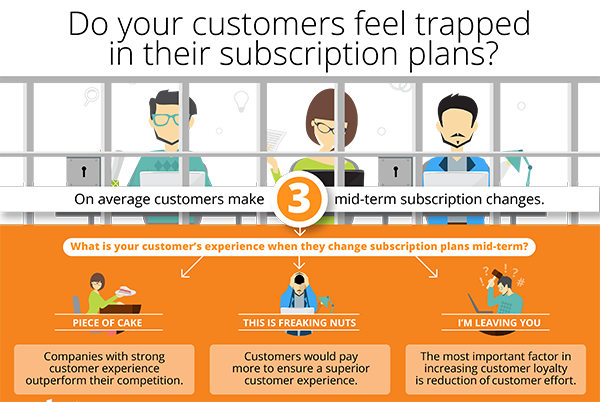 Customers may get confused, particularly when they are choosing from a variety subscription plans. Customer support is not just imperative when onboarding a new customer, but it’s critical every step of the way. Some companies seem to focus on a sandwich-style approach to customer services. Help is readily available in the beginning, forming one side of the sandwich. Then, as your lifecycle matures, that service seems to get lost in the middle, somewhere between the mayonnaise and the lettuce. It finally picks back up when a customer is in the process of cancelling their service, forming the other side of the sandwich. If you have ever tried to cancel a cable plan, only to be transferred to an elevated ‘support’ person, essentially to convince you to stay, then you know what I mean. Not only should a support team be in place throughout the customer lifecycle, but that availability should also be underscored by making it easy to locate. At the concert venue, all the employees wore identical shirts, making it easy to seek out help when a question arose. If your customer has a question about their billing, should they have to navigate through several web links to find a support number, or wade through a quagmire of phone tree options? Ensure that help is there, and the contact information front and center. 3. Provide flexible payment plans. Today’s consumers do not have the same mindset that they did 20 years ago. Customers have grown to expect flexibility, both with payment terms and billing schedules. The company that offers distinct products on rigid billing cycles is going to be eclipsed by a competitor that offers different product combinations and different billing cycles. Imagine going to a restaurant that does not accept credit cards, but you have no cash on hand. Even if there is an ATM next door, it’s not a fun place to be, from a customer perspective. Consumers do not want to be boxed in by a rigid payment system. Not only do they want to be provided with different billing options, they have come to demand it. If they cannot get the service they want from you, expect them to look for the next business that matches up with their payment preferences. On top of this, make your offerings flexible. For example, Amazon Prime offers both subscription channels as well as one-time purchases, whether it’s renting or buying a movie. The more you can tap into your customer’s preferences, the more satisfied they will be with you. It would be just as frustrating if we had gone to our concert, only to find that they offered one type of food and beverage. Even if it’s your most favorite meal, people want the option to wander to different food trucks and peruse their menus. We also loved the streamlined payment system, with the order terminal tied to a sophisticated, sleek place to swipe our debit card, speeding up the checkout process. As we all know, speed is essential, whether you’re getting food or trying to launch your company’s products. 4. Offer incentives to join—or return. It’s becoming more commonplace for a business to offer a monthly free trial, with or without the customer to provide their credit card up front. Just like the customer who wants flexible payment plans, a savvy consumer will be more apt to join up if they are given a chance to try it out ahead of time without of the risk of their credit card being charged up front. On the other side, other companies, such as Hulu, often offers a free month to incentivize customers to stay with them. This is a great way of saying, “We’re sorry you’re leaving, but we appreciate you as a customer. Here’s a month on us.” This demonstration of goodwill is often enough to give customers on the fence about cancelling a reason to stay. After the concert, amid the throngs of people all trying to leave at the same time, were venue representatives handing out coupons for $20 off their next four-ticket purchase. Guess who’s taking their kids to their first concert in a few weeks? We are all immersed in the dos and don’ts of how to run a successful subscription business. However, the primary concern should be the customers’ preferences and how you can satisfy those preferences, which can be too easy to forget at times. Recapture that perspective by stepping away from the CEO persona and back into the customer’s shoes. Sometimes, it may take something as simple as going to a concert. I’ll see you next month at Kidz Bop.